Explore Zen practice through meditation, movement, discussion and creativity. Workshop Leader - Senior Zen Student, Gwitha Kaido Nash, MRO. 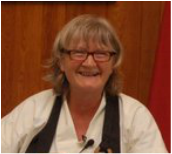 Kaido went to her first meditation retreat with Daido Loori Roshi in 1990, where she was struck by the teaching that “we are all whole and complete, lacking nothing". For more than 25 years Kaido has been a student of Zen meditation and the Zen creative process through the Mountains and Rivers Order. In 2012 she became a Senior Zen student. She practises at the Southern Sky Zendo in Nelson, and has spent periods in Zen training at Zen Mountain Monastery in the USA. She and her husband, Suido, have four children and five grandchildren. What happens when we begin Zen meditation – returning our attention to the breath, and sitting with the present moment? How is it that a process so simple can be a path to liberation from suffering? In this morning session, Gwitha Kaido Nash will provide instruction in Zen meditation (zazen), and lead us in two 30min periods of sitting. After morning tea, we’ll discuss the fundamentals of the Zen Buddhist tradition, its history, and the power of home practice. A Zen liturgy service will be followed by vegetarian lunch at midday. Meditation can give us access to a new way of being with the mind and body. This workshop uses restorative movement, body awareness and visualisation exercises to harmonise our physical energy, and develop stability in our sitting posture. The class is suitable for all levels of experience and mobility. Attention to what is ordinary can reveal the profundity of every moment. Oryoki is a classical Zen practice of using a meal to reflect on the opportunity to give and receive life. For the concluding day of this workshop, we begin early with two periods of Zen meditation and an oryoki breakfast together. There will be a short period of work before getting ready for the Sunday morning programme, starting at 9am. This early morning session is free to workshop participants. Please book in advance, as oryoki requires some training. Join us for our Sunday morning program of Zen practice, including a Zen liturgy service, seated and walking meditation, and a Senior’s Talk on the Dharma and Zen practice. A vegetarian lunch will be served at noon. Unless it compare with the amplitude of the earth. ﻿Registration required for all sessions. $20 / half day. Vegetarian lunch $5.